Thanks for visiting the CoilJet CJ-200E support section. Here you will find answers to the most common support questions our customers have. Utilize the tabs to find the appropriate selection for your needs. The motor continues to run even though the trigger is released. The unit was turned on while in garden hose mode and the garden hose was not connected to the machine. Hook up a garden hose to prime that side first. Then re-prime the tank side. 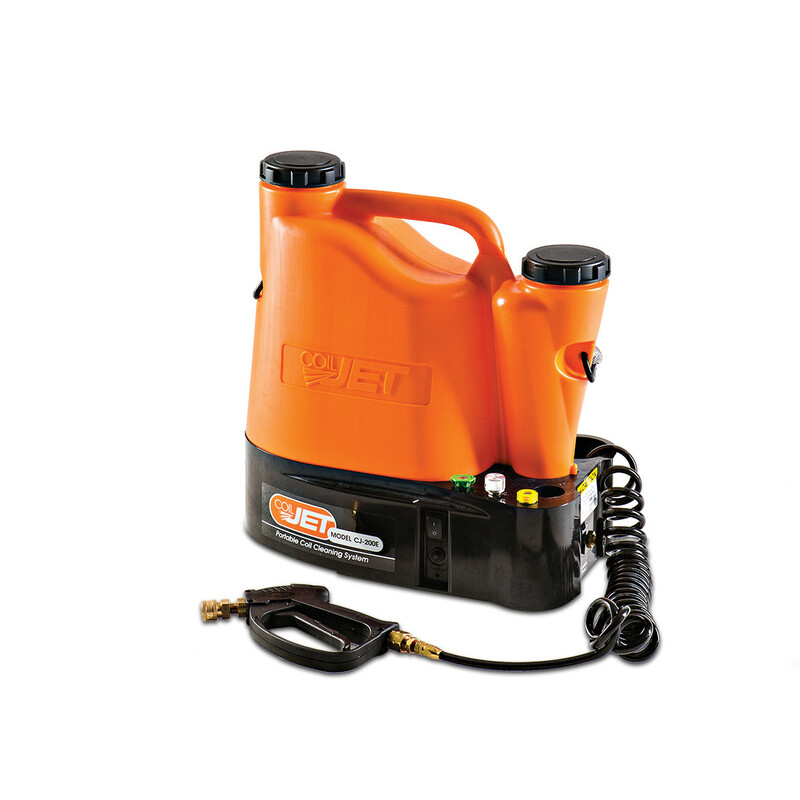 As a reminder, the CoilJet is designed for optimal use with alkaline coil cleaners. Caustic coils cleaners will degrade internal parts. If a caustic coil cleaner is required for use, make sure to remove all the cleaner after use and thoroughly flush the unit. Fill the cleaner tank with water, open the valve and empty the tank of water. If you have used a coil cleaner other than SpeedyFoam in your CoilJet please follow these instructions immediately after use. I can't seem to get any decent pressure out of it. I've tried priming the pump but after 15 minutes or so it's still just trickling out. Does it take a long time to prime the pump? Is there an in-line filter anywhere that could be clogged? No, the pump should come to pressure within seconds. Generally, this means there’s a clog in the system or pump issue. Please call us at 888-700-3540 to walk through some diagnostics. Check for blown fuse. Your CoilJet includes a 15amp fuse located in the base of the unit. Under special conditions, this fuse may blow to protect other components. To locate the fuse remove the six screws on the bottom cover of the unit. Locate the yellow fuse holder and check its condition. Replace the fuse with a standard in-line 15 amp fuse. Check for loose or damaged wiring. In extreme cases, wiring can become loose or damaged, either through shock/vibration or accidental chemical spills. With the base cover still off, check for this condition. If you find loose or damaged wiring, please contact us. Not without eventually causing damage to the pump. If a chemical of this type is used in the CoilJet it is important to flush the unit out with fresh water immediately afterward. We recommend using SpeedyFoam from SpeedClean, an acid-free coil cleaner delivers superior cleaning power without harmful effects to you and less harmful to the environment. Please refer to the CoilJet chemical compatibility chart in the downloads area of this support page for more information. Use of a coil cleaners that contain caustic agents such as sodium or potassium hydroxide may cause components within the CoilJet to fail. These chemicals are highly caustic and tend to pit and eat away certain metallic components quickly. Most issues with caustic coil cleaners occur when these chemicals are left in the system for extended periods of time, however, they may occur quicker. SpeedClean always recommends the use of noncaustic and no acidic coil cleaners like our SpeedyFoam coil cleaner. They are better for the coils, safer for the operators and better for the environment. If you have used a coil cleaner other than SpeedyFoam in your CoilJet please follow these instructions immediately after use. Our product is designed to be used with alkaline, non-acidic and non-caustic coil cleaners, as the product includes rubber and brass components. Any other use of chemical may void the warranty. Please refer to the chemical compatibility document here. However, we have heard of many customers using different cleaners successfully. Either way, we always recommend a complete flush of the system after using any kind of cleaner. If you have used a coil cleaner other than SpeedyFoam in your CoilJet please follow these instructions immediately after use.